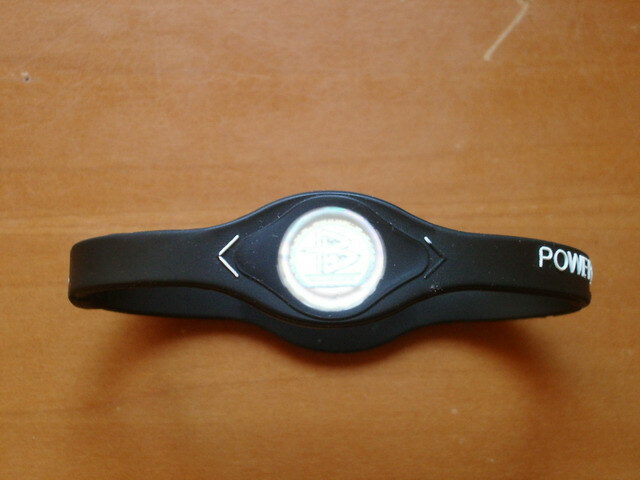 Powerbalance, the power of holograms -Update! My curiosity was piqued recently on a last-minute Christmas shopping trip. As I wandered round the sports section of a local branch of a department store, my mind was struggling to contend with the mental challenges of garish festive displays, oppressive crowding and music so good it’s only played for a few weeks every year. As the drudgery wore on, my eye was drawn to what seemed to be an exciting new product, it was presented very well with attractive graphics and sleek matt packaging. The box contained what seems to be a thin rubber bracelet with two small holographic discs embedded diametrically opposite each other. What did it do? The box claimed it was ‘Performance Technology’ but even after prying the box open and scanning the contents I could find no explanation or instructions on how this technology should be used. A youtube video also explains that technology programmed into the hologram interacts with the bodies energy field. Resonating holograms? Programmable holograms? This all sounds suspiciously new age, phrases which contain a combination of words which in isolation refer to some new science or technology but when combined fail to mean anything much at all. Youtube is packed with videos of balance and flexibility tests which show the benefits of wearing the band. There is also an informative video detailing the techniques used to achieve the apparent benfits of the band (apparently the technique is referred to as ‘applied kinesiology’). The product is endorsed by some top flight athletes, Shaquille O’Neill being in their number (obviously a product not yet banned by the NBA), and there are numerous positive reviews online. Consumers should be wary of other similar products on the market that make unsubstantiated claims, when they may be no more beneficial than a rubber band. Well there you go, although the technology in manufacturing rubber bands shouldn’t be taken for granted, it’s not the type likely to increase your sporting prowess. Any readers out there that use a power band and think otherwise? I’d be interested to hear about your views in either direction. ← No mountains, turn to freestyle!